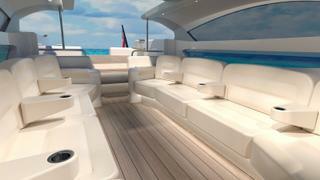 British boatbuilder Compass Tenders used last week’s Monaco Yacht Show to reveal its new semi-custom Compass Latitude range. Inspired by the yard’s work creating the tenders to 91 metre Lady Lara, the idea is to offer a set platform that can measure between 9.5 metres and 11.5 metres but alter the coachroof to suit a client’s needs and design preferences. Four designs have been created to spark an owner’s imagination, named after the four main points of the compass. The Compass South (pictured below) is arguably the most striking, with its open stern and electric sunroof allowing for great views out to sea, while retaining the air conditioned comfort that guests would expect. This design has already been built as one of the four custom tenders that Compass built for the recently delivered 123 metre Lürssen superyacht Al Lusail. Meanwhile the Compass East is a more curvaceous option with a full-length coachroof, offering interior seating for up to ten guests. The first example of this design is currently under construction and has been customised to add distinctive wings between the superstructure and topsides. The Compass North is a more traditional Venetian-style design and the Compass West completes the range, with its tapered coachroof allowing for aft-facing guest seating in the cockpit. 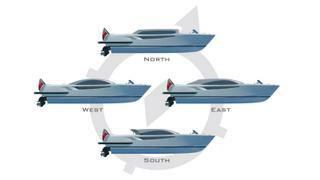 Whichever Compass Latitude option is selected, superyacht owners will get a 36-knot turn of speed, four points of access for seamless boarding, and perhaps most importantly, the semi-custom approach to construction trims three months off the build time.